Discussion in 'Cars in General' started by GTPNewsWire, Jan 21, 2019. This article was published by Andrew Evans (@Famine) on January 21st, 2019 in the Car Culture category. Danoff, AgentBlackDog and marcvic like this. Slower acceleration, worse interior, a decade old. Not entirely better. When did the 370Z start packing a straight 6? Unless you meant it’s straight packing 6 cylinders. Gregfranklin, FoRiZon, LMSCorvetteGT2 and 1 other person like this. Doesn't look so flash now that it is all written in numbers. Most hyped car of the decade. Edit: I see it was just fixed. Eh, I think the GT86 is enough proof that numbers don't always tell the whole story. A GTI will murder it in a straight line, but the experience behind the wheel in the Toyobaru is a whole different ball game. Until we get behind the wheel — which will be happening — it's hard to really pass a verdict. silverman_GT, Gregfranklin and turismoslayer like this. The Supra also doesn't have a DCT, it's the ZF 8-speed. Most hyped car of the decade. Based on what I know about the next Z, Toyota will need to up their game a bit. I just hope the new Z doesn't jump that high in price. I know you're not allowed to give specifics, but it sounds like A) There is a successor to the 370Z on the way and B) It's not going to be a Crossover. Both of which are fine by me! If it does end up using the 400hp V6, it wouldn't surprise me if it does jump to the $50,000/£50,000 price range. Excluding the Corvette, it would offer the most respectable hp/cost ratio. I'm curious on why the Corvette was used and not a Camaro SS. Great article nonetheless! Is it just me or do the Supra's acceleration figures seem a bit optimistic? 10hp less than the Cayman S (albeit with 20% more torque), 472 extra pounds but faster to 60mph? Also the time stated for the Cayman S is for the PDK, not the 6 speed manual (Porsche claims 4.6s for the manual). They are all 2 seat sports cars. Only the Mustang is an outlier, and that's because Ford doesn't have anything closer. I have a feeling Toyota has setup the Supra's gearbox to excel at 0-60 runs. From a rolling start, I'd imagine a C7 Corvette would freight-train the Supra. Additionally, all the other competitors (except the Alpine) have models or variants above them in performance and price. Meaning, for instance, Porsche is not going to go out of their way to make the Cayman S dash to 60mph in a surprisingly fast time, because that makes the argument for the 911's higher price a little tough to explain. They've geared down or otherwise created space between the Cayman and base 911 since the beginning. The same is less true for the others, but I think still valid. 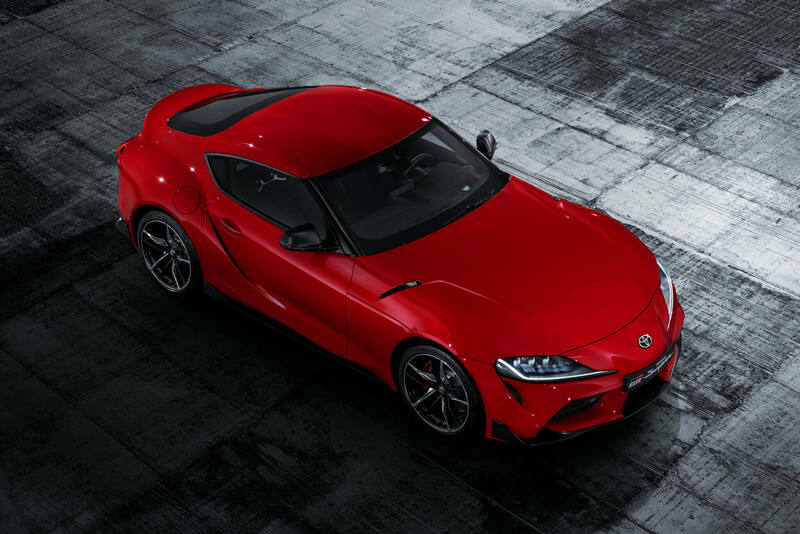 The Supra, on the other hand, can be rated as optimistically as Toyota wants without fear of jeopardizing sales on any other models. A 7AT Nismo 370z should be just as fast in the real world, I would estimate. VXR, WolfpackS2k, Cerebral303 and 6 others like this. The Bullitt has a higher top speed then Gt and Supra. Mustang does 0-60 in 4.2 sec and has 420 torque at 93 octane. Who wrote the article? Gt top out at 157 mph and Bullitt is 8 mph more. Like @Eunos_Cosmo suggested, we tried to keep it to two-seaters. The Mustang is the exception, and it's also quite similar to the Camaro, so we left the latter out. On a similar note, we forgot the closest related sibling: the M2 competition. Over in the UK even that will be slightly cheaper than the Supra, which I'm guessing will fuel more than a few comparo tests. Huh, Porsche USA's website says 4.4 for the manual, with or without the SC package. I wouldn't doubt in that case Porsche is protecting the 911 a bit. Yeah but everything else is bigger: the engine, the suspension, the wheels. It's also quite a bit more luxurious inside. The Alpine A110 is a pretty tempting proposition if they actually sold it here. The 370Z might not be bad but it's really old. The Supra would probably win unless the next Z packs the 3 liter turbo from the Infiniti Q50. Don't confuse 0-60mph with 0-100km/h, which is 0-62mph. Porsche does indeed claim 4.6s for the manual... from 0-62mph. Industry standard - and I personally hate this - is to subtract 0.2s from the 0-62mph time for 0-60mph, and indeed Porsche USA, which uses 0-60mph rather than 0-100km/h used in Europe, Japan and Australia, has the 4.4s claim. It's right there in the first post. That's via JATO Dynamics, the industry standard body both in Europe and the USA. The US-market car is slightly different from the European market car - in fact it has a little extra power (480 vs 459, on the same 93MON/95RON fuel; 529Nm is, for reference, 390lbft) - but as it seems to no longer be US market industry practice to give either 0-60mph times or top speeds, I went with the verifiable UK figures. Yes, that made it awkward to find the Corvette figures too, but I did it. Any 0-60mph time you've seen for the US-market Bullitt is as tested by a magazine or other outlet, rather than from the manufacturer. Ford does mention the 163mph top speed of the Bullitt in pre-release literature, as an 8mph margin over the 155mph GT (both disagreeing with your figures; yes, I can show you the press releases), but thereafter there's been no mention of it. Perhaps it's in the owners' handbook? Psst.... Nissan, this is your chance to make a new Z with the Infiniti 3.0t and undercut the Supra. On a similar note, we forgot the closest related sibling: the M2 competition. Wouldn't the M240i be even closer competition, both in price and performances? Actually, come to think of it, the M240i is cheaper, has the exact same engine and can be equipped with a 6-speed manual... And it has a back seat and most likely a bigger trunk. The Alpine looks the best on paper for me. Not lardy and unnecessarily overpowered like so many cars these days. A mere 1.8 but still properly rapid and also it's the best the brand does, its their flagship car and that means more coming from a Alpine than a Toyota or a Nissan. Supaboost and TomBrady like this. Whoa! The Cayman comes with a 4 cylinder now?! I did not know that. Is this a Porsche-made engine? Beyond the reasons listed by Slipz & Eunos, the Corvette likely starts out as Chevy's prime competitor all things considered. The SS starts at $42,995 & you'd have specifically tack on the $7,000 1LE Track Package to get as close as possible to a Supra in pricing/performance. This option then puts the SS on pace with the Stingray in multiple categories. 0-60: 4.1 vs. 3.9 sec. The Camaro performs a little better than the Stingray on circuit tracks whilst the Stingray has the advantage in straight line speed. But, in the fairness of comparing what you get right off the assembly line vs. the that & tacking an extra box to boost performance, the Stingray is probably the better starting point. dice1998 and SlipZtrEm like this. Just because I'm curious, what is the tire size & model on the 1LE vs the Stingray? According to MotorTrend, the Corvette has Michelin 245/35ZR19 front & 285/30ZR20 summer rear run flats standard. The Magnetic Ride Control changes the tires to 35R19/30R20. The 1LE has Goodyear Eagle F1 Supercar 3 285/30R20 & 305/30R20. Yeah I get the sense that, on equal tires, the 'Vette would be comfortably faster around basically any given racetrack. If the times were that close with the C7 on run flats, that's actually pretty impressive. I looked up the Grand Sport & up out of curiosity myself, didn't know Corvettes equip Michelin run flats (285/335) across the board unless you get a Z07/ZR1 Track Pack options. Then the tires are bumped to Pilot Super Cup 2s. Yep. Boxer four turbo. You can get a six, but only on the GT4 and GT4 Clubsport.